Among the advantages of NewTek™ NDI® is that it is resolution independent; video at any resolution can be transported with sufficient network bandwidth, and for most resolutions, 1-gigabit network will suffice. NDI also is extremely efficient at encoding various resolutions. For example, on an Intel® i7 CPU, NDI version 2 will encode 1080p at 2200 frames per second (fps), 4k at 780fps, and 8k at 210fps. It will also include 16 or more channels of floating point audio at any sample rate, bi-directional communication with upstream and downstream meta-data support. Another benefit of NDI is that as a freely available standard, any vendor in the industry can use it to enhance the capabilities of their products. The most common use is for video interchange with other production software and hardware that supports NDI. However, vendors can also employ NDI for new features or functions in the direct operations of their production tools. 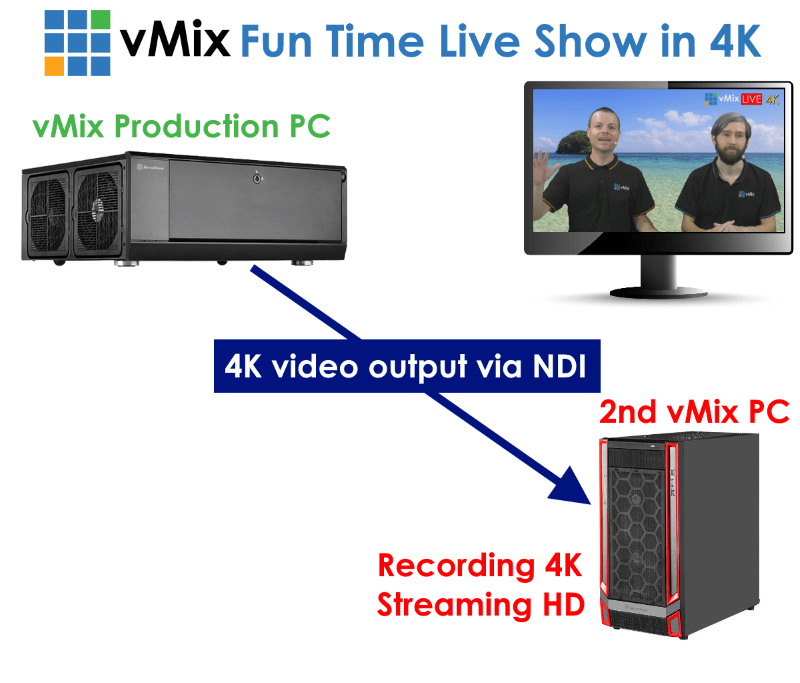 The technical team at vMix recently provided an example of using NDI directly within the product, in this case, their software vision mixer. They produce a regular Friday live show and wanted to begin making the show available in 4K on YouTube. They determined that streaming to YouTube is limited to at most 2K, but is most reliable at HD. They also determined that doing a live multi-camera production plus the encoding for recording at 4K and for streaming was more than one system should try to handle. So, they set up one vMix production system to handle the live production with multiple cameras, and a second vMix system that simultaneously recorded the 4K program at full resolution, and encoded and delivered an HD stream to YouTube Live. 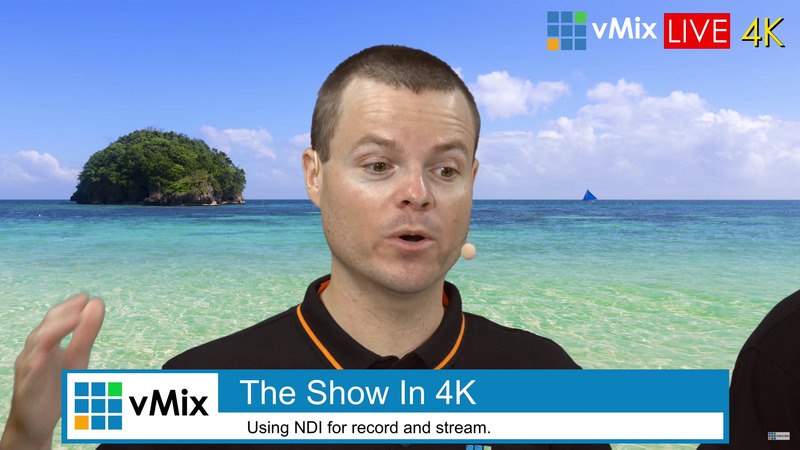 They used NDI to transport a 4K live video stream from the first vMix production system to the second vMix production system. In this way, they ensured reliable live-production level performance for switching, graphics and all other production operations on the first system, plus dependable real-time performance for the final 4K recording and HD live-streaming operations on the second system. They later uploaded the 4K version to YouTube so that viewers could watch the 4K version on demand.